No one is talking but the ripple effects of what the national selectors back home have done to Virender Sehwag and Gautam Gambhir are discernible as the Indian cricket team waits in suspense over whether they will make it to the finals of the tri-series. Sehwag does not find a place in the team for the Asia Cup announced yesterday and Gambhir, who has captained India to a 5-0 ODI series win against New Zealand, has been upstaged by Virat Kolhi who was made vice-captain. MS Dhoni’s job as captain is not under threat even after two dismal losses in England and Australia. The non-inclusion of Virender Sehwag in the team for Asia Cup took a curious turn today with a media report claiming that the opener had asked the BCCI for rest because of back spasms. "I have back spasms. I need some rest. After reports of a rift with MS Dhoni, Virender Sehwag (pic) has been ‘rested’ for the Asia Cup. Indian cricketers and millions of their fans would be unified in praying for an Australian victory when the hosts take on Sri Lanka in the last but the most crucial league match of the ODI tri-series on Friday. His team’s prospects of reaching the tri-series final have been dented after the massive loss to India but Sri Lankan captain Mahela Jayawardene today said he is glad that at least the islanders' fortunes are still in their own hands unlike their sub-continental neighbours. Their fate not in their hands, India have put practice on hold depending on how the Australia-Sri Lanka match of the ongoing cricket tri-series pans out in Melbourne tomorrow. After being in the lead for the first two days Bangalore’s S Chikkrangappa fell behind after the third round of the Samarvir Sahi Amateur Golf Championship being played at the CGC here on Thursday. Some of the best known amateur golfers from the city will compete in the Chandigarh qualifier for the 12th edition of Mercedes Trophy, one of the largest amateur golfing events in the world. A pleasant day turned for the better under lights as local team Sher-E-Punjab spanked Chennai Cheetahs 5-2 in their World Series Hockey match here tonight. All roads lead to Jalandhar, home of late Olympian Surjeet Singh, as the action rolled on for the second consecutive day in the Series. After the men pugilists won applauds in the international arena with as many as four players qualifying for the London Olympics from the World Boxing Championship held at Baku in 2011, now its time for the women to sweat hard to live their London Dream. The Indian Olympic Association (IOA) Executive Board will hold a crucial meeting at Olympic Bhawan here tomorrow to discuss various pressing issues, with the top-most item on the agenda being Suresh Kalmadi’s status vis-à-vis the IOA, and India’s decisive stand on Dow Chemical’s sponsorship of the London Olympics. Indian cricketer Yuvraj Singh has completed the second cycle of chemotherapy, continuing his recovery from a rare germ cell cancer in Boston (United States). "Second cycle has finished today ! Had a bleomycin shot feeling weak but I'm sure tom will be a better day! The team kept away from the media and, in fact, did not even practice. The team management was unwilling to comment on clear divisions within the team. Sources within the team said it was clear that the Delhi boys, Sehwag and Gambhir, have been sidelined because they had differences with skipper Mahendra Singh Dhoni which they have aired publicly. Sehwag had questioned Dhoni’s statement that seniors like him were slow in the field while Gambhir had told the media that India should have won its match against Australia earlier than the last over in which Dhoni scored the winning runs. Clearly Dhoni has had his way against Sehwag and Gambhir and also in ensuring that players like Suresh Raina and Ravindra Jadeja, considered close to him, are not axed despite indifferent performances. Reports persist that Sehwag had declined to hold a joint press conference with Dhoni last week to deny reports of a rift between them, but no one is willing to go on record. Sehwag, who was officially ‘rested’ for the Asia Cup on fitness issue, is ready to play in the best-of-three finals against Australia should India qualify. That will depend on whether Australia beats Sri Lanka tomorrow. Those who feel that Sehwag has been done in point out that if he was not fit he should have been back home now. If his poor form was an issue then Sachin Tendulkar’s inclusion for Asia Cup is not warranted. The non-inclusion of Virender Sehwag in the team for Asia Cup took a curious turn today with a media report claiming that the opener had asked the BCCI for rest because of back spasms. "I have back spasms. I need some rest. I have never kept my team management in the dark as far as fitness is concerned. My injury is open for everyone to see," Sehwag was quoted as having said in 'Midday' newspaper. However, this flies in the face of what the chief selector Krishnamachari Srikkanth said yesterday while announcing the team. Srikkanth said that Sehwag had been rested on fitness grounds and when a reporter followed up with some questions, the former India captain lost his cool, asking the scribe to "shut up". If Sehwag had asked BCCI for rest, Srikkanth could easily have disclosed that to the media. Moreover, Srikkanth told a TV channel last night that Sehwag had a shoulder injury, while as the newspaper quotes the opening batsman as saying that he had "back spasms". "I have never hidden my injury before, or fitness problems. Even my shoulder operation was planned after consulting the then coach Gary Kirsten and skipper MS Dhoni," Sehwag said. The newspaper claimed that captain Mahendra Singh Dhoni and coach Duncan Fletcher told the selectors that Sehwag was seeking rest after a streneous tour of Australia. But for the miraculous 321-run chase in under 40 overs against Sri Lanka, India were out of the fray but the win has given them a glimmer of hope. If the Aussies beat the Sri Lankans, India will be through to the best-of-three finals. In fact, the Indians have put their practice on hold till the result. A major worry for Australia, already in the finals, is the stiff back of skipper Michael Clarke. Clarke, who has already sat out of a few matches in the series because of the problem, may not be available for the match. "We think he's going to be okay for Friday. But we're certainly going to have a low-risk strategy. If he's just about right, I don't think we'll play him. But I think he'll be okay," national selector John Inverarity has stated on Clarke's fitness ahead of the match which is statistically of no significance to Australia. Should it be decided to rest Clarke, the leadership would be once against taken over by all-rounder Shane Watson, who was magnificent with the ball in the match against India. Pace sensation James Pattinson is also expected to be back after recovering from a foot injury that he picked up during the Sydney Test against India in January. A concern would be the broken toe of pace spearhead Brett Lee even though he has vowed to play through the pain barrier. Sri Lanka, on the other hand, have quite a few issues to deal with after the stunning debacle against India. The side was more or less through to the finals before the abject surrender in Hobart, despite putting more than 300 runs on the board, jeopardised their chances. No bowler has ever conceded a higher rate of runs in an ODI stint of at least five overs than the 12.52 that Sri Lanka's star Lasith Malinga did in his 1-96 against India. A bowler, who is feared internationally, it was a thoroughly humbling night as Virat Kohli took him to the cleaners. "Going in to the last game it's in our control, what we need to do. It's a good position for us to be, rather than depending on someone else to do some favours for us," Jayawardene said. If Australia beat Sri Lanka in tomorrow's last league match, India will be through to the best-of-three finals. Sri Lanka were on course of a final berth before India left them demoralised by chasing 321 in less than 40 overs in their previous match. "From where we started on this tour, I think we've improved as a team and maintained a consistency. That's very important for us going forward," Jayawardene said. "Whatever happens tomorrow we will definitely get a lot of positives out of this. Our challenge will be to try and keep this consistency going, because if we play the way we're playing now ... we'll win more matches than we lose. We're quite happy with that," he added. Jayawardene said his team has good all-rounders which wouldbe crucial. "Going forward we've always wanted to have two or three allrounders in a team. These guys are taking responsibility. Angelo (Mathews) in the long run will probably be more of a batting allrounder than a bowling allrounder. Two days after that amazing 321-run chase inside 40 overs was scripted at Bellerive Oval, the team is pinching itself in disbelief at that mammoth effort for it had all but given up hopes of carrying any further on this disastrous tour — a few of them had actually booked their return tickets to home from Hobart itself. But they have some hope now because if Australia beat Sri Lanka, Dhoni's men have a chance to make the finals. Once again, India were able to win on the shoulders of an individual which has literally been the story of their cricketing history. Little is achieved by team together than by an individual defying all odds and playing exceptionally well. Kapil Dev did so during the 1983 World Cup with an unbeaten 175; Gautam Gambhir played that astounding 75 in the finals of the 2007 Twenty20 World Cup and Yuvraj Singh stood out in the title triumph of the 2011 World Cup. After being in the lead for the first two days Bangalore’s S Chikkrangappa fell behind after the third round of the Samarvir Sahi Amateur Golf Championship being played at the CGC here on Thursday. Another Bangalore player Khalin Joshi emerged as the new leader after playing a superb third round of five-under 66 for a total of 208. Joshi now goes into the final round on Friday two shots clear of Chikka who also played a steady round of two-under 69 to end the day with a total of 210. Gagan Verma lies a distant third with a three-round total of 219. Joshi, who was lying second overnight, had four birdies and an eagle against one late bogey on 17th. He hit a purple patch with a birdie on 11th, eagle-2 on 12th and another birdie on 13th enroute a 66. Chikka, who opened with a bogey, had four birdies and two bogeys in his 69. Gagan Verma continued his upward surge after a disappointing first round. Verma, finalist at All India Matchplay who began with a 78, added a 71 after his second round 70 (219). Manav Das and Trishul Chinappa with 72 each were tied for fourth at 221. Honey Baisoya (78) and Ashbeer Saini (75) were tied sixth at 222. Six golfers were lying tied on 226, while Jasjeet Singh, who was second after the first round, was lagging way behind at 225 alongwith Subhankar Sharma. Manpreet Mann fared a little better with a three round total of 224. 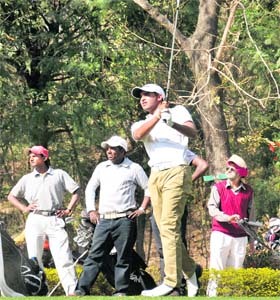 Chandigarh duo of Raghav Bhandari and HS Kang had scores of 231 and 229, respectively. More than 100 golfers will tee off at the Panchkula Golf Club on Saturday. The play will be in Double Peoria format in three handicap categories. Mercedes Trophy is one of the world’s largest amateur golf tournaments involving over 58,000 golfers in 43 countries worldwide. In India qualifying rounds are being held in 10 cities - Pune, Ahmedabad, Chennai, Hyderabad, Jaipur, Mumbai, Delhi, Chandigarh, Kolkata and Bangalore. The national finals in India will be held on April 13-14, 2012. The three winners at the national final will participate in the MercedesTrophy World Finals - at Stuttgart, Germany against winners from all over the world. As an interesting aspect of Mercedes Trophy, a golf clinic for beginners was held by Indian National Golf Academy certified coach at Jaypee Greens that saw a large number of exciting golf beginners learning new skills. Mercedes-Benz has been a strong patron of golf with a prominent presence at amateur and professional tournaments across the world including The Masters, The British Open and the US PGA Championship. But even the presence of players like Deepak Thakur, Prabhjot Singh, Harpal Singh, Gagan Ajit Singh and Vikram Pillay failed to pull spectators for the match at Olympian Surjeet Hockey Stadium here. The Punjab outfit thrashed Cheenai Cheetahs in what was a rather one-sided affair. The visiting team started off well but Adam Sinclair missed the first chance to score after goalkeeper Dinesh Ekka managed to divert the ball outside the goal area in the fifth minute. Taking full advantage, the Punjab outfit hit back with a counter attack and rolling substitute Mandeep Antil helped the team take the lead in the 7th minute. After the first quarter, the home team again had ample chances to double the lead but they failed to do the same after their drag flickers miss three penalty corners in a row. On other hand, the visiting side scored the equaliser through Imran Warsi who converted the first penalty corner awarded to team (1-1). Right after 10 minutes the home team managed to take the lead again, after stopper of Chennai Cheetahs gifted a penalty stroke followed by a stick check by Gaurav. Harpreet Nagra slotte dhome with ease and made it 2-1 in the 34th minute. In the third quarter, the visiting side tried hard to come back but failed after Mark Harris missed a one-on-one opportunity. Soon after this, Prabhjot Singh took the ball from left flank and successfully won a penalty corner in the 44th minute but Harpal Singh again failed to convert. But Prabhjot got a chance after making his signature run and took the score to 3-1 in the 49th minute. 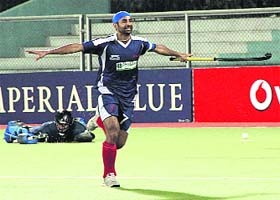 After the captain took the team close to a winning position, his former Indian counterpart, Gagan Ajit Singh added to Chennai’s misery as he scored a brilliant fourth goal in the 57th minute. In the last quarter Imran Warsi again struck to make it 4-2, after converting the third penalty corner in the 63rd minute but captain Prabhjot Singh wrapped up the match after scoring his second and the team’s fifth goal in the 70th minute. 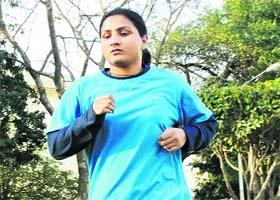 As part of preparations for the first and only Olympic Qualifying tournament for women boxers, the 2012 AIBA World Women’s Boxing Championships to be held from May 9 to 20 in Qinhuangdao, China, the Indian team will take part in the 2012 Asian Confederation Women’s Boxing Championship from March 16 to 26 in the capital of Mongolia, Ulan Bator. Five-time and reigning World Champion MC Mary Kom will lead the Indian squad, which will include Pinky Jangra (48 kg), Sonia Lather (54 kg), K Mandakini Chanu (57 kg), L Sarita Devi (60 kg), Meena Rani (64 kg), Monica Saun (69 kg), Pooja Rani (75 kg), Bhagyabati Kachari (81 kg) and Kavita Chahal (+81 kg). Talking to The Tribune at NIS, Patiala, coach Chandra Lal said the girls were undergoing rigorous training and their hardwork would certainly yield good results. “The girls are training alongside boys at NIS Patiala, which gives them an extra edge. They not only get tips from us but also watch the boys in action which helps them grasp latest techniques. Moreover, India has been among the few countries that have pioneered women’s boxing in the continent. The Asian Championships has always been a happy hunting ground for the Indian women pugilists and they will certainly repeat their success. This Asian Championships will be the big litmus test for them before the World Championships and the Olympic Games,” added Chandra Lal. The International Olympic Committee (IOC) had written to the IOA three letters, seeking the IOA stand on Suresh Kalmadi’s status, after he was arrested and jailed for the alleged irregularities in hosting the 2010 Delhi Commonwealth Games. Though Kalmadi wrote to IOA acting president Vijay Kumar Malhotra on February 8, categorically stating that he will not “exert his rights and obligations as the president of the Indian Olympic Association as I am fully occupied with my (Parliamentary) constituency and legal matters”, a section in the IOA wants to take strong action against Kalmadi - who technically continues to be the IOA president, and unless he resigns, a regular president can be elected only in the IOA Annual General Meeting, slated to be held after the London Olympics in July-August - while another group is advocating a soft approach towards him, as it would not be possible for him to return to the IOA or sports administration, and his political career is also on the line. “So there is no point in being very vindictive towards him, and more over, he has not been convicted for any offence, though he spent nine months in Tihar Jail”, said a source. The Executive Board will also ratify the re-constitution of the Ethics Commission and framing of rules and regulations for the various commissions as in an earlier meeting of the IOA, the committees/commissions constituted by IOA acting president Vijay Kumar Malhotra immediately after he took over, was disbanded though Malhotra was given the power to recast them, which he did, and now awaits ratification from the Executive Board. The meeting will also take up the contentious issue of Dow Chemicals’ sponsorship of the London Olympics as there were protests against the multi-national company, which was part of Union Carbide when the terrible Bhopal Gas Tragedy happened in 1984. All sorts of reports and rumours have been floating around regarding India’s participation in the London Olympics, though Malhotra refuted them, saying that there was no plan to boycott the opening and closing ceremonies, or wear black arm bands during these ceremonies. “If we boycott the opening and closing ceremonies, we will be debarred from the Olympics. And we cannot participate in the games wearing black arm bands. It does not behove a country of India’s stature to adopt such methods”, Malhotra told The Tribune. A source in the Sports Ministry said the Government was also waiting for the IOC response to the letter sent by joint secretary in the Ministry, Rahul Bhatnagar, to IOC president Dr Jacques Rogge, on February 24, seeking clarification of Dow Chemicals’ role in the Olympics as “it is the successor company of Union Carbide”, but asserting nevertheless that “We cherish and celebrate the noble ideals of the Olympic Movement, (and) India stands firmly committed to these ideals and the values they promote of friendship, unity, brotherhood and compassion”. “We are dismayed that the IOC has not respected the sentiments of a large group of stakeholders, including Olympians, and withdrawn its association with Dow Chemicals”, Bhatnagar added. But the IOC has not replied to the letter, and the Ministry is waiting for the IOC reaction before making its position clear. “We can react only when we receive the IOC reply”, said a source in the Ministry, adding that boycotting the Olympics was not an option, for sure.